LEARN ABOUT THE DECORATIVE ELEMENTS OF FRANCE TO ADD PARISIAN ELEGANCE TO YOUR HOME. BEHIND EVERY SET OF FRENCH OAK DOORS LIES THE POSSIBILITY OF ENCOUNTERING HEAVY SILK DRAPERIES, CRYSTAL CHANDELIERS, GILDED PANELING AND CLASSIC UPHOLSTERY. 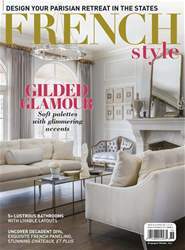 In her new book French House Chic, author Jane Webster takes readers on a journey of timeless traditional elements, delving into their history and demonstrating how they will bring any home lush, Parisian flair. The French are known for their attention to detail, and their wall paneling is no exception. With its ornate designs and often gilded borders, boiserie— or intricately designed wood paneling—is guaranteed to bring elegance to any space. “Well-designed or original wall paneling can bring a scale and proportion to a room or create a mood that cannot be obtained quite as successfully in any other way”, Webster writes. “From a purely practical perspective, boiserie can also incorporate concealed storage or even a secret door, as is so often the case in French châteaux.” They were used in all parts of the home, including doors, cupboards, windows and shelves.